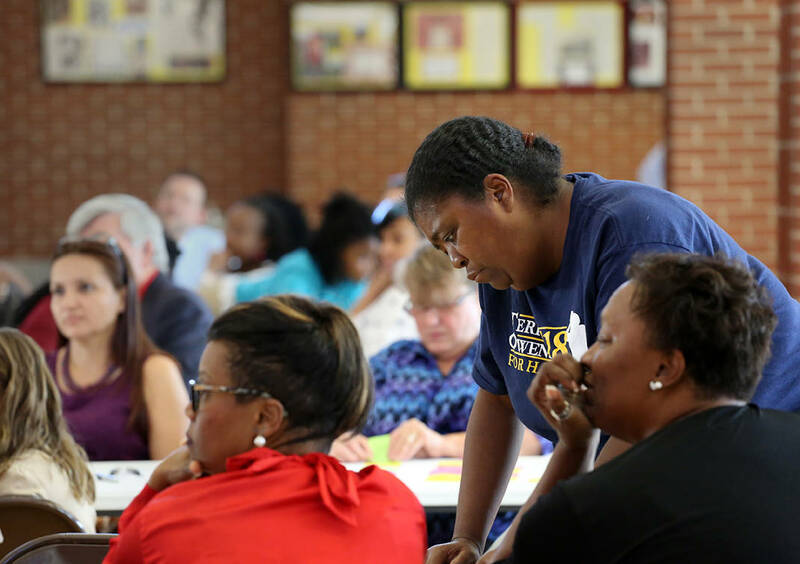 Staff photo by Erin O. Smith / Cassandra Robinson, who has children that graduated from Howard, works with others during a visioning event to come up with ideas for the new Howard Middle School Thursday, August 23, 2018 at Howard High School in Chattanooga, Tennessee. Attendees sat in groups, watched videos and came up with ideas for what they believed the new Howard Middle School should look like. A second visioning session will be held at 8:30 a.m. Friday at the Howard School, 2500 Market St. The event will be in the school’s library. Dariana Mull wants to go to a middle school that is a happy and joyful place to learn. She also wants students to have flexible environments that allow them to feel safe. "I feel like they should have the chance to learn where they feel comfortable," said the fifth-grader at Battle Academy. "It's hard to learn if you don't feel happy and upbeat." Mull's fellow fifth-grader, Brandon Oakes, also from Battle Academy, agrees. His ideal school would have supportive teachers and interactive work. "Personally, I would like a kind school," he said. Benajah Tucker, a sixth-grader at Chattanooga Girls Leadership Academy, said a school should be a place where everyone can keep up. "Where everyone knows and people stay back to help them," she said. These three students were among dozens of families, educators and community members who came together Thursday night to envision what the new Howard Middle School might look like. Partners of the design firm, 2Rev, tapped to create the school, led participants through a series of brainstorming activities at the Howard School. The new school is scheduled to open in August 2019 and will serve students in grades 6-8, many of whom live and go to school in the Howard School's feeder pattern. Currently, those students attend middle school at Orchard Knob Middle or Dalewood Middle school, but as areas of downtown Chattanooga have grown, the need for a new school has increased. Jill Levine, chief of the Opportunity Zone, said it is important to Hamilton County Schools leaders to talk with community as they prepare to launch the new school. The new middle school will be a part of the Opportunity Zone, which contains the district's 12 highest-needs schools, which serve predominatly students from communities of coinentrated poverty. "We want to hear from parents, students, teachers and community members about what they want in the school," she said. "This is just the start." In 2009, the Hamilton County Board of Education voted to close the former Howard Middle School to help balance the district's budget, but some community members felt the board was targeting schools with predominantly black students. Renovations to the previous school's building at 100 E. 25th St. are already underway. Included in Superintendent Bryan Johnson's more than $100 million capital plan last fall was the renovation and re-opening of the middle school. "We have an incredible opportunity, this time next year we will launch a new middle school. Our dream is to create a school that is exciting, innovative and very, very effective," Levine said. On Thursday night, participants discussed what students need to know to be prepared for the future. Answers ranged from reading, writing and arithmetic to language skills, communication and the ability to interact and collaborate with diverse people. "The world is changing, and our schools aren't keeping up," said Ben Rayer, partner at 2Rev, to the audience. The design team facilitates similar community meetings as it works to put together new schools across the country. "We are running a process like this in communities all across the country and the lists are the same," said Todd Kern, also a partner. He summarized what the audience was sharing about its desire for students and what they need to be successful such as problem-solving skills, compassion, empathy and the ability to advocate for themselves. "We want our kids to be able to problem solve, but we also want them to be able to create, to be creators," said Zac Brown, director of secondary schools in the Opportunity Zone. Community members also shared what they want in a leader. The district is interviewing five finalists for the principal position in the coming weeks. The new principal will be part of the planning process of the school, thanks to a more than $240,000 grant from the Benwood Foundation. "We need someone who is going to be committed," said Cheryl Bryant, a retired police officer and current assistant band director at The Howard [High] School. "Not someone who is just coming in for the incentives." In this community, it is important for someone to be "a servant leader," said Le Andrea Ware, executive principal at Howard. "Someone who is going to be a servant leader. In this community, you have to do all of the above." English teacher Ashley Cox echoed the idea that the school's new leader needs to be committed. "A lot of our middle schools have seen a lot of turnover," she said. "We need someone who is committed to the school for the long term." Henry Slate, who was among the first class of Howard School graduates in 1966, said the desire to launch a great school was something that should have been happening from the beginning. "It should have been like this all along," he said. "Now you're gonna come along and make a great school, and that's good. But make it for all, make it for everybody." Contact staff writer Meghan Mangrum at mmangrum@timesfreepress.com or 423-757- 6592. Follow her on Twitter @memangrum.